This fund helps us cover veterinary costs for emergency rescues when rabbits need us. We are currently helping with a confiscation of 81 rabbits in Lafayette, IN. Uriah is one of those rabbits. Despite his health challenges, Uriah is an incredibly sweet, friendly, curious rabbit. He does not let his past - his tattered ears, bites, or his painful lower lip - diminish the light radiating from inside him. This little guy is an inspiration, period. We think Uriah deserves a fighting chance for a happy life. We hope you agree and will support his veterinary care with a donation. The estimated cost for Uriah’s initial care and treatment is $2000. Indiana House Rabbit Society indianahrs.org is a volunteer organization dedicated to improving the lives of domestic rabbits through its education, fostering and adoption programs. It has a vast network of organizations equally passionate about animal welfare and IHRS is frequently contacted to assist in the rescues of abused, unwanted and abandoned domestic rabbits. We could use your help! 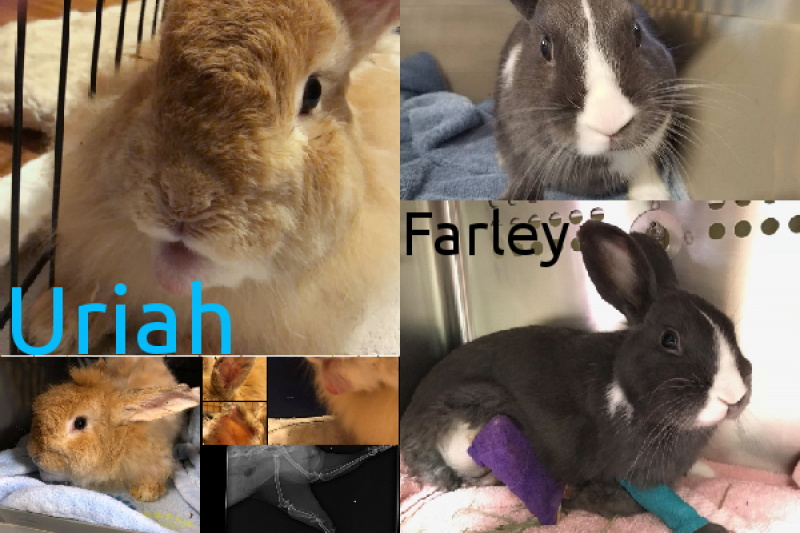 Your donation to IHRS will be used to help pay for the veterinary care and treatment that so many of our foster rabbits need. Will you help us help some-bunny? I hope everyone had a speedy recovery!